I was long overdue for an emo show at the Echo when last Thursday night came around. The Echo Park venue is spacious but still feels intimate, and this balance proved wonderfully conducive to a night of versatile performers. The evening started strong with a solo performance by Jacob Sigman. Armed only with a keyboard, Sigman hypnotized the crowd through a mix of provocative ballads and lighthearted, uptempo love songs. I was especially captured by his first piece, a “salvation song” that I’ve since been unable to identify. That’s all right by me - I’m not sure any recorded version could stand up to Sigman’s stirring live rendition, consisting only of his soulful voice over a single sustained guitar note. The rest of his set dripped with equal heart and easygoing cheerfulness. Sigman is a master of what I can best describe as pop spirituals: equal parts bouncy fun and poignant emotion. Following was Jetty Bones, the solo project of Ohio native Kelc Galluzzo. Combining elements of pop punk, emo, and a touch of surf rock, Jetty Bones delivered nonstop crowd-pleasers, while seemingly having the time of their life. The band danced around the stage with reckless abandon, high-kicking and headbanging without loosening their grip on tight instrumentation. Galluzzo herself is an incredible frontwoman. Rather than commanding the audience’s attention, she led everyone into a cathartic, celebratory space by joyful example. My favorite song of the set was “Clear Honey”, a hard-hitting ode to self-discovery and lust for life. 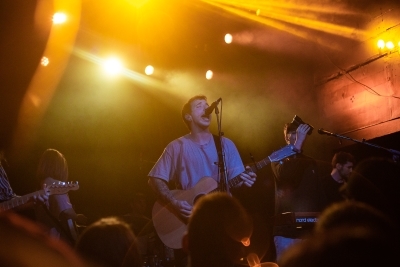 Though Mat Kerekes shared later in his set that this was his first time headlining in Los Angeles and he’d been nervous before taking the stage, he slipped into the spotlight effortlessly and brought the night’s already-high energy to a peak. This should come as no surprise; the Michigan-born songwriter is a veteran of the rock scene. 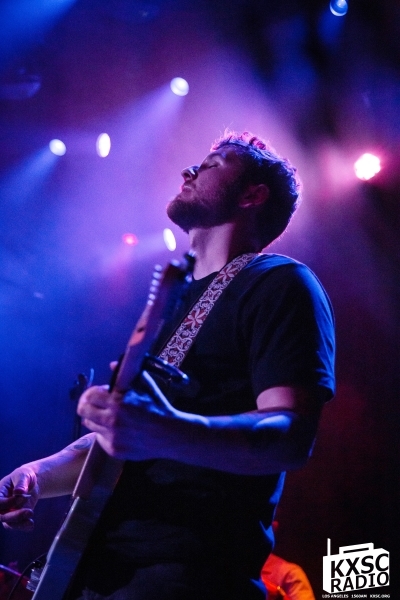 His role as frontman in alternative rock band Citizen has long wowed fans, but Kerekes’ solo project further showcases his prowess as a multi-instrumentalist (he wrote and performed each part on 2016’s Luna & The Wild Blue Everything, save violin). He stuck to guitar and vocals during the live set, but the confidence and emotional candor that characterize the aforementioned LP still poured out of Kerekes as he delivered a versatile repertoire to the raving crowd. Kerekes’ live band is full and spirited. Between three skilled guitarists, another appearance by Jacob Sigman on keys, and an impenetrable rhythm section, the room was positively vibrating. It sounds the way sitting on your front porch on a summer evening feels: youthful, alive, and pleasantly nostalgic. Highlights of the set included both pensive acoustic numbers and rowdy, punk-infused bangers. “Diamonds”, released earlier this year, was a crowd favorite. Though it began simply and softly, the first chorus erupted into a bold, exuberant anthem that showed off the full range of Kerekes’ strong voice. Sigman’s piano chops were also on display for a vibrant mid-song solo. Much to the crowd’s delight, Kerekes and company came back for an encore after fourteen songs. The finale, “Sunday Night”, was a slow-burning, heartfelt ballad that Kerekes had held off on playing earlier in the evening, calling it “too sad.” Though I love a good mid-set mood swing, I think saving it for last was a good decision, because the audience was invested in the song in a very special way. The dancing turned to swaying, voices rose up to sing with the band, and everyone seemed to wake up from the mania of a high-energy show to enjoy an almost meditative moment. It was an honest, simple encore that perfectly captured the sense of camaraderie fostered throughout the night.